Continuing his publishing streak, Steve Howell has teamed up with Brian Sullivan and has produced another must-have book titled "Peterson Guide to Bird Identification—in 12 Steps." Available now on Amazon or your local bookstore. WINGS was recommended by roughguides.com in a recent article on birding in the Caribbean. Click on the link to read it! 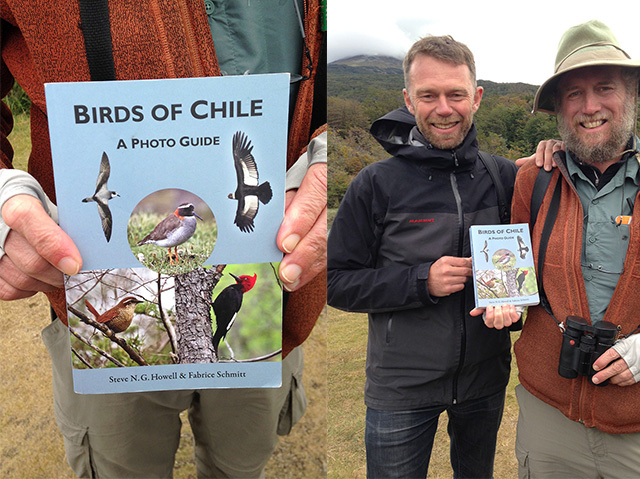 March 19: New ‘Birds of Chile’ book from WINGS leaders Steve Howell and Fabrice Schmitt just released! After a few years collaboration, thousands of pictures, and uncountable hours in the field, Steve Howell and Fabrice Schmitt just published their photographic field guide ‘Birds of Chile’. With its pocket size, short texts focused on identification marks, and numerous pictures showing the birds in their habitat, their new book is the perfect tool to identify birds of this part of the world. Participants of the ongoing cruise ‘Buenos Aires to Santiago’ have been able to test the very first copies of the new book, and it works! If you too want to use this new field guide with their authors, you can join them on one of their forthcoming Chile tour or cruises! WINGS leader Derek Lovitch is the lead editor of a newly published book titled Birdwatching in Maine: A Site Guide. This is a great new resource for finding birds throughout this beautiful state. The state’s wealth of undeveloped land and its extensive coastline, countless islands, and varied habitat combine to host an impressive diversity of birds at all times of year. Birders travel to Maine from near and far to seek hard-to-find species, from the only Atlantic puffins breeding in the United States on offshore islands to Bicknell’s thrushes high in the mountains. Derek leads two tours for WINGS to this region of the US; Maine Coast in Fall and Maine and New Hampshire. February 15: South Africa 2017 pricing reduced! Our ever-popular tour to South Africa has had a price reduction in 2017. There has never been a better time to go to this amazing country, full of spectacular flower blooms and abundant bird life. Steve Rooke has been leading this tour for over two decades and never tires of visiting one of his favorite countries. Join him in 2017! Susan Myers has two new publications, a revision of her Birds of Borneo (Helm) and Wildlife of Southeast Asia (Princeton Pocket Guides). Both are listed on Amazon. Susan's comments on the Borneo revision follow: "I'm really thrilled that an updated version of Birds of Borneo has been released. It was a lot of hard work over the last two years or so to get this accomplished; I'm very happy with the result and I hope others will be as well. There's now a new and much more detailed introductory section, the taxonomy has been updated also and various other changes have contributed to what I hope is an even better book than the original." We've added a new Borneo departure, May 11-25, 2017, in anticipation of the appearance of Susan's revised Birds of Borneo due out in the next few months. Listen to WINGS leader Gavin Bieber interviewed about birding in Gambel, Alaska by birder Bob Kissel for his radio spot on WFHB. Hear the interview here. Join Gavin or Jon Dunn in 2016 for one of our popular tours to this birding hotspot. The nesting location of Markham's Storm-Petrel has been discovered...in the middle of the Atacama Desert. You can read the details here. The brilliant Sunbird leader, James Lidster, also knows his way around facebook, and he's agreed to take on management of both the WINGS and Sunbird facebook pages. He's already introduced new things such as a bird quiz so please stop by from time to time to see what else James has done. A link to our facebook page can be found at the bottom of this webpage. WINGS will have a strong presence at the upcoming Rio Grande Valley Birding Festival in Harlingen, Texas in November. Keynote speaker Steve Howell will be leading a seminar titled "Shift Happens: Rare (Vagrant) Birds in North America - Why, Where, and Whence?". This talk is derived from his recently published book, Rare Birds of North America. Other senior WINGS tour leaders including Jon Dunn and Jake Mohlmann will also be on hand to lead field trips. If you attend, be sure to stop by our booth in the trade show area to meet Erin Olmstead, the newest member of the WINGS office family.